Scarlet Tanager by Joel DeYoung. It’s winter, do you know where your birds are? 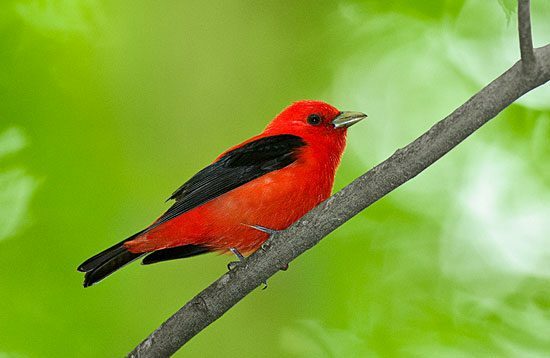 For many bands of the summer songbird rainbow—Baltimore Orioles, Scarlet Tanagers (above), and 17 species of warblers—the answer could be Central and South American coffee farms. Forty-two migratory songbird species commonly overwinter in heavily shaded coffee plantations. For more about shade coffee, see “Making Sense of Coffee Labels” on our blog. For much more detail about coffee labels and their meaning visit the Coffee and Conservation blog, operated by University of Michigan biologist Julie Craves. Not all coffee retailers advertise that their coffee is Bird Friendly. If you’re unsure whether your favorite coffee source is Bird Friendly, you can check this list of certified Bird Friendly farms organized by country. The Committee for Environmental Cooperation is a joint effort by the governments of Canada, Mexico, and the United States. They provide background on sustainable coffee and a wealth of information and research. And 22 of those species have significantly declining populations. Shaded coffee farms beneath forest canopy provide critical strongholds of quality habitat for Neotropical migrants, says Bridget Stutchbury, a veteran migratory bird researcher at Toronto’s York University. Birders need to use their coffee money to support this coffee habitat, she says, because tropical forest continues to be cut down at a time when songbirds can least afford to cede more ground. Case in point, Nicaragua’s forest cover shrunk from more than 11 million acres in 1990 to 7.7 million in 2010—a 30 percent decline in just two decades. But Nicaragua still has some of the best forested habitat in Central America, because most coffee is still grown there in the same rustic way it has been since the Dutch introduced it to the New World in the 1700s. Traditionally, coffee has been a forest-floor crop grown under a dense overhead canopy. Artificial fertilizers aren’t needed, because decaying leaf litter recycles nutrients to feed the coffee plants. Pesticides aren’t needed to control insects, because birds eat bugs like the coffee farmer’s archenemy—the coffee borer. Rustic coffee has been grown this way on the Selva Negra coffee plantation in Nicaragua for more than 100 years. Amid Selva Negra’s verdant, lush rainforest—where vines and epiphytes crawl up the tree trunks and hang from the canopy—Resplendent Quetzals alight on branches alongside Baltimore Orioles. Howler monkeys bellow at dawn. Some mornings plantation owner Mausi Kuhl sets out slices of fresh papaya to feed Scarlet Tanagers making a migratory pit stop on her farm. Kuhl says the vast majority of coffee in Nicaragua is still grown under forest cover, because it’s the only way many coffee farmers know. But that might be changing. Sun-grown coffee farming is a slash-and-burn affair: forest is cut down, and pesticides and fertilizers are used to stimulate higher yields. Money changes landscapes, as any Midwesterner in America’s Corn Belt knows. What’s needed is an economic counterbalance, a price premium paid to coffee growers who preserve standing forest and bird habitat, says Stutchbury. “We can’t demand that they don’t cut down their forests and give up money unless we’re willing to give them something as compensation,” she says. That’s the idea behind Bird-Friendly coffee—the real deal certification from theSmithsonian Migratory Bird Center, not just any coffee labeled shade-grown. Some coffee on the market claims to be shade-grown, but it’s grown among sparse trees. Some shade-grown coffee is even grown under the flimsy cover of banana trees fed artificial fertilizers and pesticides. The Bird-Friendly certification is the gold standard, a super certification that combines organic and fair-trade standards with eco-requirements for forest shade cover, multilayered canopy, and the presence of epiphytes (havens for insects, and thereby feeding stations for birds). “We call it shade coffee, but Bird-Friendly coffee should more appropriately be called ‘forest coffee,’” said Stutchbury. The problem is, Bird-Friendly coffee is hard to find in stores. It currently constitutes less than 1 percent of the American coffee market. But, it’s readily available from online coffee sellers. And considering that heavily shaded coffee farms hold seven times greater bird species diversity than sun-grown coffee, Stutchbury says it’s worth the extra effort for coffee drinkers who care about birds. 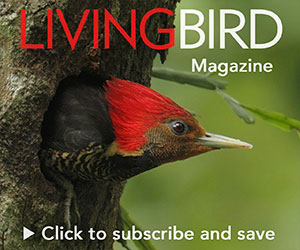 “Buying Bird-Friendly coffee is one of the best ways you can do your part to preserve wintering habitat for our migratory songbirds,” she says. Gus Axelson is a science editor at the Cornell Lab. Is drinking shade-grown coffee good for birds? What's the difference between shade-grown, organic, fair-trade, and Bird-Friendly coffee? How are coffee and birds related?